Deb's Cup of Tea: Happy Anniversary! It's been 2 years that we've been a family. We've gone from hiding in my closets to lying pretty much anywhere. 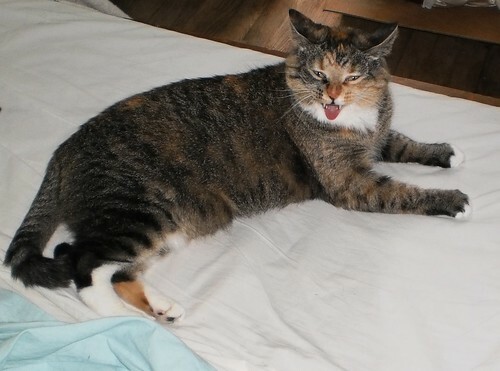 She was yawning but the caption to this photo could be, "MOM! Enough with the photos! I was trying to sleep!" Here is Pilchard making sure I know whose recliner this belongs to. I've decided to put a throw on the seat. 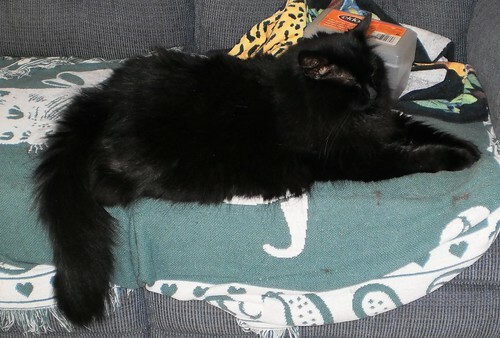 You can see the small clumps of black fur on the throw. Once a month, I put a clean one on and wash the current one. Just the price of being owned by a long-haired black cat. 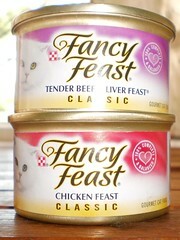 In honor of the occasion, I got them some Fancy Feast. I am ever so grateful they don't prefer this for food. I had some difficulty getting the pull top open. That was quite a shock. I used to be able to pop the tops right off those, but this arthritis is causing trouble. This morning, I divided the 3 ounces of beef and liver into quarters and put the spoonful on a plate for each. They sniffed them for a bit before digging in. Mija ate about half of hers. Pilchard cleaned up her plate, after knocking some off the plate and onto the floor, and then cleaned up what Mija didn't want. There is half a can left so that will be put out at supper. I think I'll save the chicken feast for Thanksgiving. I really don't want them getting used to this. It's way more expensive than the dry and probably higher in calories. They need to lose weight and I'm pretty sure Fancy Feast won't help that. It's hard to believe it's been a whole 2 years. Sometimes, it does feel like they just got here and I find myself missing one of the 5 who has gone over the rainbow bridge. But, when I wake up in the morning to a purring cat tucked right up next to me or when I try to read my newspaper and a black face pokes under the paper and meows for my lap, I am ever so grateful they are here.